Tinea Pedis – otherwise known as Athlete’s Foot – is a fungal infection that can be successfully treated in a number of ways. The itching pain, stinging, burning sensation and discomfort you experience can be soothed considerably by natural remedies. 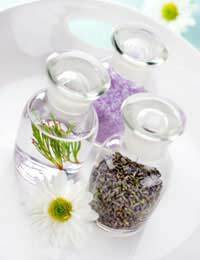 These may include using homemade preparations or shop-bought natural products and remedies. If infection spreads to under the toenail it can make Athlete’s Foot difficult to treat with ease. Onchomycosis – the thickening, discolouring, crumbly and separation of the nail – makes treatment a more difficult and lengthy procedure. Taking care to prevent the spread of the fungus, that thrives in warm, damp environments, will help minimise the potential risk of having to find a cure, A simple step like not going barefoot in public places can considerably reduce the chances of the spread of Athlete’s Foot. Being more health conscious is therefore essential in maintaining a good footcare practice. Tea Tree is a powerful antiseptic that is used in many homes for a wide variety of uses. It is an essential oil that is able to kill bacteria and reduce fungal infection. Tea Tree Oil, used in a cream formulation, can reduce burning, stinging, inflammation and scaling. You can successfully treat fungal infection by soaking your feet in a foot bath containing a solution of four part warm water to one part white vinegar. After soaking for about 20 minutes thoroughly dry your feet and sprinkle baking soda between the toes. This works in the same way as an antifungal shop-bought product. Rinse the powder off after 10-15 minutes and then massage refreshing Tea Tree Oil carefully between each of the toes. This will provide immediate relief from any burning or stinging sensation. To provide relief from painful itching or stinging an antiseptic mouthwash, you most probably already have in your bathroom cabinet, may be used in much the same way you would apply Tea Tree Oil. The antiseptic properties of the product will ease discomfort quickly. Garlic may also provide some form of pain relief. Rubbing a cut garlic clove on the infected area of the feet allows the natural oils to impregnate the fungal infection. Allow this to sit on the skin's surface for 5 minutes and then wash and dry feet thoroughly. This process will need to be repeated over a number of days until your fungal condition noticeably improves. It is not much use treating your feet for athlete’s foot if you do little to stop the spread of this fungal infection in your shoes and footwear. If you do not address the spread of infection in your shoes you will continue to reinfect yourself. Use an anti-fungal footcare spray or powder and spray or sprinkle in your shoes every time you wear them. A solution of four parts water, one part white vinegar, 4 drops Tea Tree Oil and 4 drops of peppermint oil – mixed in a refillable spray bottle – also provides an effective treatment.